the same little girl in the minnie mouse raincoat, only wearier. you got that just right. happy birthdays to hal and alice, and to you, mama. i love this little post and all of it's truthiness. you are just the cutest person in the whole wide world. happy birthday to hal & alice!! I feel this way so often. Like, how can something I remember so clearly be, calendar-wise, so long ago? How can the pictures from my childhood suddenly look old? How can college be ten years ago? Time is such a weird thing and it makes me think all over again of how it's fluid and non-linear even though we live it in a linear way. And now I'm thinking about the illustrations in "A Wrinkle in Time" that explained the tesseract and I tell you, I never understood that dang tesseract. 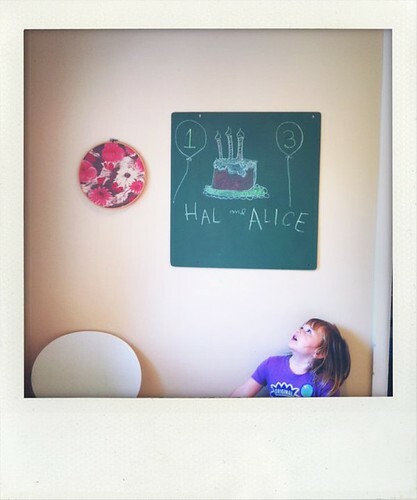 LOVE the birthday cake illustration for Hal and Alice. I am seriously fond of your kids, in an-over-the-Internet fashion. Which means I think they are super cute and funny and I would totally take them out for ice cream any day of the week. Have a happy birthday weekend with the little sweethearts! I anticipate lots of new cute play happening post-birthday gifts. fun fun. Our 10 year high school reunion was last weekend (?). We didn't go. A decade ago we knew that we wouldn't go. :) Have a fun celebration of the amazing lives you've brought into the world. What a sweet post, hope you do have a lovely birthday weekend! 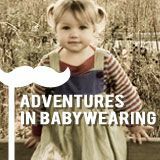 I keep waiting for the moment when I feel like an adult, from the outside I am doing things other adults are doing, like having babies, being engaged and paying bills, but I certainly dot feel like one... I wonder if I ever will feel like one or it will forever feel like a game of dress up and pretend?! You totally nailed it! The calender is working against us. So, so, so true. Hurry up... slow down. The calendar figures out which one we want and then does the opposite. Have a wonderful weekend with your "babies". Sop up every moment like gravy. This post...you said it Right. Happy Birthday to your babies! I will be 47 next month. Forty-effing-seven. And I have no idea how that happened. When will that grown up feeling kick in? Does it ever? I kinda hope it doesn't. sooooooo beautiful. see, you say the things that i'm not good at saying out loud. things that are in my brain but get lost on the way to my fingers. i'm loving all over this post tonight. Time is most definitely a thief. I just love the way you write. "You are that same little girl in the Minnie Mouse raincoat, just wearier" -- like this a whole, whole lot. And I so very much like you. Happy Birthdays to your 2 sweeties. "Celebrate good times, come on," a wise man named Kool once said. I just nodded my way through this. Exactly. Yes. How did it happen. I do believe it and yet, I feel cheated. Beautifully expressed. P.S. Did you mean it about BlogHer in NY? I would love to meet you. so many happy birthdays. i feel like my new little one will be in great company. Happy Birthday to Hal & Alice!